Looking for some fun activities for your children this spring? How about having them perform in their own mini-opera…or on the McCaw Hall stage as part of Seattle Opera’s season-ending production of Madama Butterfly? Have a look at the following exciting opportunities for young people to be involved with opera, and keep an eye on our calendar for new activities and events for people of all ages. 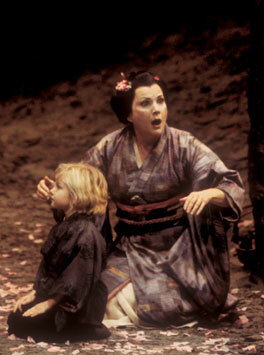 Timoney Moyer and Sheri Greenawald in Seattle Opera's 2002 Madama Butterfly. Seattle Opera is holding auditions for two child supernumeraries to portray Butterfly’s child in the upcoming production of Madama Butterfly. We’re looking for two Asian children, 3-5 years old, who are small for their age and have good focus and concentration. The two children will alternate between the 8 performances, which run from May 5-20, 2012. This is a volunteer position, with rehearsals beginning April 9. For more information or to sign up for an audition, please call Paula Podemski, Seattle Opera's Production Supervisor, at (206) 676-5812. Is your child or grandchild out of school on Friday, March 16th? We’re offering a one-day Opera Camp that includes singing, acting, arts and crafts, and movement, which culminates in a mini-opera performance that your little one helps to create! The camp costs $40 and runs from 9 a.m. – 3 p.m., with aftercare available for an additional fee. For more info and to register visit our website. In April, we’re offering two Murder... and other Foul Play opera camps: April 9–13 with Bellevue Youth Theatre for grades 4–10, and April 16–20 with Seattle Public Theatre for grades 6–12. Planning ahead for the summer? Young people grades 4–10 are invited to take part in a Youth Opera Chorus Camp, held at McCaw Hall from July 9–13. From July 30–August 25, we partner with Seattle Public Theater for a Sweeney Todd camp, targeted at grades 7–12. Info on all these camps is available here, or contact Barbara Lynne Jamison at 206-676-5564 or Barbara.Jamison@seattleopera.org. Alas, your Opera Camp April dates don't align with the Shoreline School district (April 23-27th).